You’ll immediately succumb to the spell of this spectacular property, where vast swaths of marble unroll at your feet and every luxury stands ready at your fingertips. Impressive in both size and measure, 8-bedroom Villa Shiro rises above lush greenery as a soaring beacon of white: the call to the Marbella lifestyle and this ultra-luxurious mansion - opulent and more, even amidst the lavish homes of La Zagaleta. Villa Shiro is a one-of-a-kind masterpiece with a front-row view in La Zagaleta. Here, you step into a world bathed in white: White, for the vast swaths of white marble that frame blue skies and bluer seas. White, for cream-and-ivory colour palettes that contrast with vibrant art and designer furnishings. White, for the illuminating flashes of sunlight that glint off a sparkling pool and dapple lush gardens. White, and yet not just white. For Villa Shiro – named after the Japanese word for “white” – is the white of brilliant sunlight: not colourless, but rather composed of every colour in the spectrum. White and grey, for the marble that unrolls at your feet. Black, for the Asian-inspired lacquer and prints that grace the home. And then, every colour in between, to represent the myriad shades and hues of Villa Shiro: saffron walls and red bar stools, jade onyx tiles and purple sunsets, gilded staircases and ochre rugs. And, of course, the green of the landscape and the blues of the cobalt sky, the turquoise sea, and the cerulean pool. Villa Shiro is kaleidoscope of luxuries – a home as unique, as lavish, and as vibrant as the rainbow. Villa Shiro, a home as extravagantly apart from its neighbours, as its neighbours are from the rest of the world. Villa Shiro is a home built to impress, with vast slabs of marble flooring and panoramic windows, Asian influences and valuable artefacts, designer lighting and stylish furnishings. Every room here is a gallery, with many pieces to draw the eye: A fountain in the entry and a chandelier in the stairway, an ancient Chinese statue in the living room and an art piece in the master. Villa Shiro stands a home beyond the abilities of mere photography or words: a true and elaborate showpiece, designed as much to impress as it is to invite. 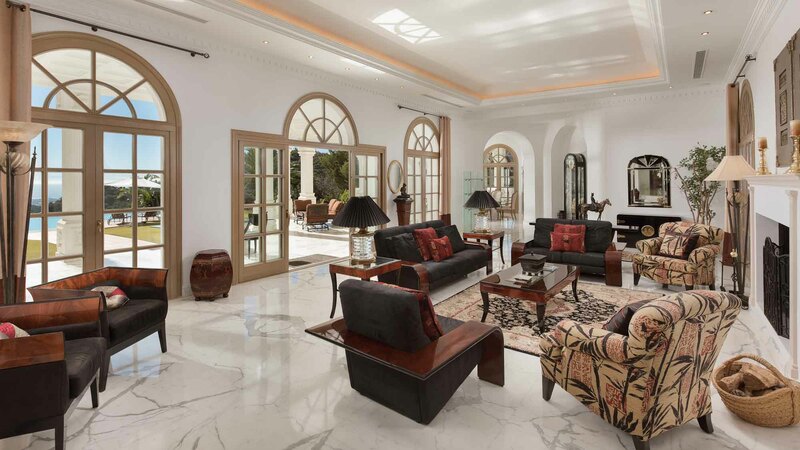 Embracing its natural surrounds, the home pulls from the Costa del Sol to impress with stone columns and graceful archways, crown-moulding and coffered ceilings, tiled walls and marble floors that are both timeless and elegant. Villa Shiro is evidence of thoughtful vision, of the master craft that is both architecture and design. It is a love letter to the Andalusian countryside and sparkling Marbella, to Eastern influences and a luxury lifestyle. It is your welcoming to the Costa del Sol. Rising like a white beacon amidst lush greenery, Villa Shiro welcomes guests to the lavish Costa del Sol, playground of the Spanish rich and famous. As you wind through the verdant hills above Marbella, your first glimpse is of Villa Shiro: a white flare of Spanish Colonial architecture, set against the lush backdrop of La Zagaleta, one of the Costa del Sol’s most exclusive communities. Impressive as it may be, that first glimpse is but a ripple on the home’s luxurious surface. Villa Shiro, between rolling hillsides and the Mediterranean Sea, is a study in outdoor enjoyments: Expansive terraces with cosy seating, immaculate gardens and lush landscaping, a colour-dappled poolside terrace, and sun loungers to ring the expansive infinity pool. And then, those views – a feature beyond luxury, beyond opulence, beyond the influence of man. This is Mother Nature’s own art and here it is on full display, in spectacular panoramas that encircle Villa Shiro, gracing the home with some of Marbella’s most striking Mediterranean and mountain vistas. Villa Shiro enjoys daily housekeeping and a full linen change twice a week. The team of staff also attend the pool and garden as required. Additional hours, personal laundry and babysitting may be requested, payable direct. When you book a villa with The Luxury Villa Collection, our Guest Experience Team will also be on hand to help with all your holiday arrangements to ensure a smooth stay. At Villa Shiro there is also a dedicated villa manager and local team based near La Zagaleta who can assist with extra services such pre-arrival shopping, wine orders, chefs, transfers, nannies, etc. Villa Shiro is within easy reach of a whole range of amazing experiences near Marbella to add to your travel memories. From exciting family adventures like canyoning or mountain biking to world-class golf, gourmet delights to beauty spa’s, we work closely with the best local suppliers to help make your stay extra special. Explore the cities of Andalucia with a personal guide from our expert partners. They offer bespoke itineraries, all with a door to door service in air-conditioned vehicles. A perfect choice for your stay in La Zagaleta would be an escorted trip up to the white village of Ronda, which sits atop a scenic gorge and offers a real taste of Andalucian life, or try a Wine and Tapas Tour around Old Town Marbella or Malaga. Our complimentary hamper is our way of welcoming you to Spain. Then if you prefer not to cook, your concierge can organise professional villa chefs who can prepare a range of local or international dishes for you and your guests. For a taste of authentic Spanish cuisine, ask about our gourmet Spanish menus, Paella demo’s, wine tasting, or book a Tapas tour with our expert foodie tour guides. To help you get the very best from your stay at this villa, your Concierge is happy to assist with transfers, car hire, chauffeurs or shuttles during your stay. Please note that all vehicles must be booked by our team as they have to be registered in an out of the estate by security. The formal living room of Villa Shiro is located just off the main entrance hall and offers ample seating on black velvet and Asian-style furnishings, which surround an open fire. French doors open onto a shady terrace with additional seating and views over the vast swimming pool and sparkling sea. A family lounge offers cosy seating on over-size beige sofas, perfect for family movie night or a round of competitive PlayStation gaming. There is also a billiards table and sound system in the lounge. Outdoors, the poolside terrace offers seating and gathering space for time together beneath the Spanish sun. The indoor formal dining room, which offers seating for 8 to 10, is located just past the kitchen for seamless service. Wrap-around garden, mountain and sea views can be enjoyed while dining. Additional dining space (seating up to 16) is available on the shaded terrace, or in extended space – doubles as a breakfast room – off the kitchen. Several of the villa’s bedrooms also offer private terrace seating, equipped with dining furniture to accommodate taking breakfast in your own suite. Villa Shiro’s spacious, cottage-style kitchen is fully equipped for a professional chef, with facilities that include an induction hob, double oven, service hatch and a huge American fridge/freezer, plus a 50-inch TV screen for entertainment while cooking or breakfasting. The kitchen also offers a breakfast table with striking red seating. The separate guest (or staff) apartment hosts an American-style kitchenette, as well. The villa and gardens are centred around a vast infinity pool with panoramic sea views and Roman steps at either side. A large poolside terrace offers sun beds and a shady pavilion, for those who prefer to relax out of the sun. Enjoy Villa Shiro’s complete home cinema and theatre, with seating, surround sound, and a cinema screen. A comfortable family lounge provides a second entertainment area, with PlayStation, karaoke, billiards, sound system, media station, and a 56-inch television. The villa has a complete, private health club in the basement: A fully equipped gym, several fitness centres, a treadmill, showers, and a steam room. Additionally, the downstairs recreation area offers seating, a bar, and games area with traditional poker, chess, card tables, and table tennis. Doors lead out to Villa Shiro’s extensive grounds (2.4 hectares / 6 acres). Master Bedroom: Asian-themed, 100 square-metre master suite occupies the entire top-floor wing. Opulent, super-king-sized bed, luxurious chaise-lounge, and two-person snuggle chair. Suite opens onto a large terrace with sweeping mountain-to-sea views. The en-suite master bathroom is a show-stopper, with floor-to-ceiling jade onyx walls, his-and-hers basins, dressing table, separate shower, and hexagonal spa-bath for two, bathed in light from a domed sky light. A window seat with valley views rounds out this striking space. Bedroom 1: Top-floor guest bedroom with white-and-red décor, king-sized bed with four-poster frame, and private side terrace. En-suite bathroom with modern beige tiling and marble, a single basin, large bath tub, and separate shower cubicle. Bedroom 2: Top-floor family suite with wraparound side and front-panoramic terrace. Very high spec, with gold-and-cream décor, including a king-sized, four-poster bed; French doors on two sides open to a large terrace and stunning sea views. Connecting bathroom with single basin, separate shower, and peach-coloured marble hexagonal bath. Bedroom 2 interconnects with Bedroom 3, to form a family suite. Bedroom 3: Second bedroom in the top-floor family suite, located off Bedroom 2. Offers a small queen-sized bed and large wardrobes. Shares bathroom with Bedroom 2. Bedroom 4: Ground-floor, left-wing family suite, accessed via a small lounge area. Black-and-white colour palette with a queen-sized bed, leather headboard, and lacquered mirror furniture. Luxurious en-suite bathroom laid in opulent chocolate brown marble, with a single basin and large corner bath tub with window views to the garden. No shower. Bedroom 5: Second bedroom in the ground-floor, left-wing family suite. Decorated in a white-and-saffron colour theme, with a wooden framed bed. En-suite bathroom with peach marble bath, separate shower, single basin, and window views to the garden. Bedroom 6: Located in a self-contained apartment, shared with Bedroom 7, and offering a private living space with fully equipped American kitchenette and breakfast bar. Queen-sized, wooden frame bed. En-suite, cream marble bathroom with bath tub and window views to the side garden. Bedroom 7: Second bedroom in the self-contained apartment below the pool, with a double bed and yellow headboard, Oriental fan décor, and Chinese lamps. Bathroom 7 is a mirror image of Bathroom 6, but with terracotta-coloured marble. Notes: Some bedrooms have space for an additional bed for a child or a cot, please ask us for details. Additional bedrooms are available for staff, if required. While the villa is private and neighbours are not within viewing distance, please note that all bathrooms at the villa have large windows onto the gardens. Villa Shiro is not wheelchair accessible, due to changes in level and absence of a lift. Villa Shiro is absolutely unique and quite unforgettable! Having passed through the grand entrance and paused for a quick ‘Wow!’ at the views, I was impressed by how welcoming it actually is for families with children. The owners have young children themselves, so there are well-contemplated spaces to make guests of all ages feel welcome. On the other hand, if you just want to impress colleagues or clients, show off a new product launch, or enjoy a special family celebration, then this villa is certainly one heck of a stand-out option in La Zagaleta! Villa Shiro is looked after by a regular team of staff including a dedicated Concierge manager to assist clients of The Luxury Villa Collection. The villa enjoys daily housekeeping and 3x weekly linen change. 8 bedrooms to accommodate large families with staff, including inter-connecting family suites. Villa Shiro takes pride of place in La Zagaleta, a private country estate shared with the world’s elite. Bordered by the Ronda mountains and the rolling hills of Malaga, on a lush bluff gazing out to sea, the private estate of La Zagaleta enjoys one of the most privileged locations in Andalusia, and indeed, in Spain; An ultra-private and gated estate 20 minutes north of Marbella. As you make your way to the villa, you’ll wind through mountain roads and woodland, where deer and wild boar still make regular appearances. La Zagaleta is uniquely private and secluded, offering some of the area’s most magnificent views and landscapes, yet you are just half an hour from Puerto Banus (18km) and an hour to the stunning town of Ronda. La Zagaleta is a privately owned and managed estate, where your personal privacy is assured, making this the destination of choice for dignitaries and VIPs.